Eighteen(!) 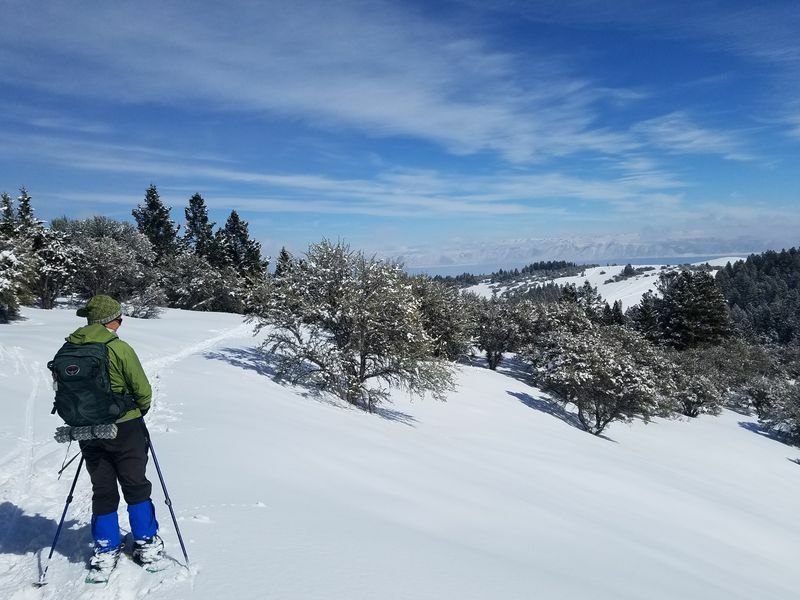 energetic people met at Smith’s Marketplace on Sunday morning to take in the leisurely Limber Pine Trail. Participants included Dave W. and Maggie (trip leader) on skis with Jane, Dave P., Kathy C., Kathy T., Michelle, Dave, Ian, Brent, Lynne, Bryce, Tawnya, Bree, Teresa, Susan, Jesse, and Becky on snowshoes. 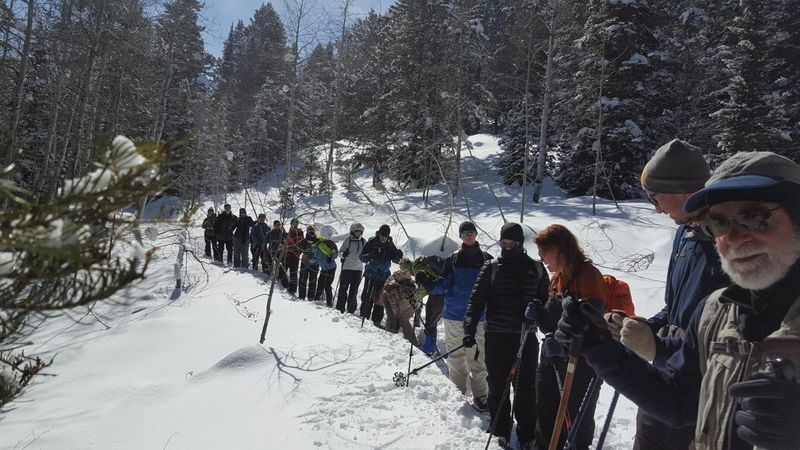 After arranging carpools, the caravan drove 45 minutes up US-89 to the Limber Pine trailhead. Parking was limited to the shoulder of the highway with a brief walk to the trailhead. 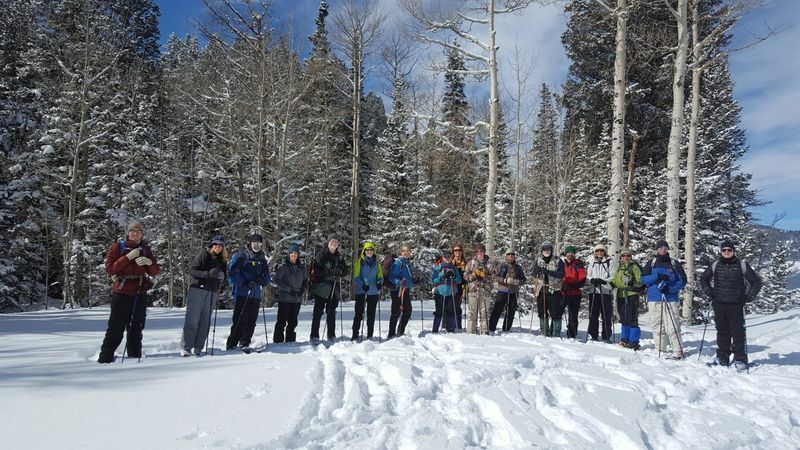 Upon arrival, the group saw several Boy Scouts coming back from an overnight trip where they dug out snow caves and set up a temporary fire pit. 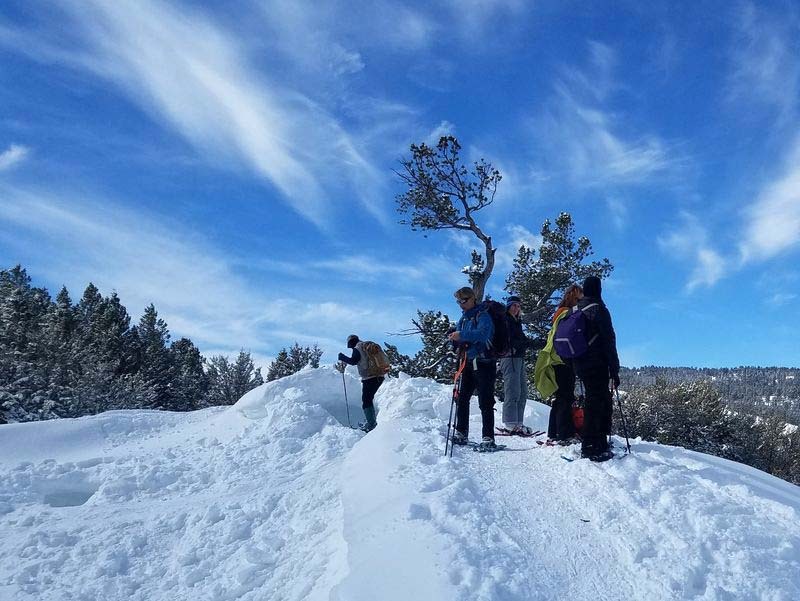 The group started on the trail around 11 AM with a beautiful blue sky, no wind, and warm temperatures. 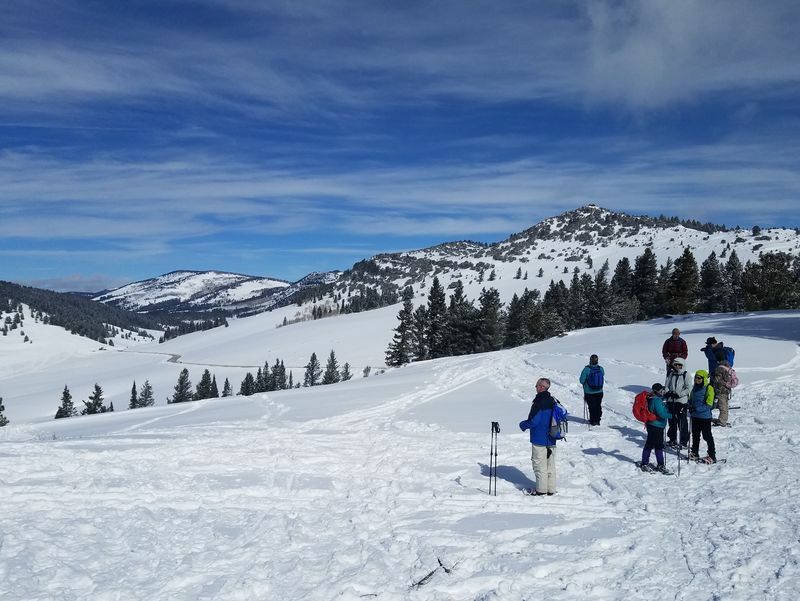 After ascending the switchbacks for the first half mile, the trail leveled out and the group enjoyed a nice overlook of the Sinks area. 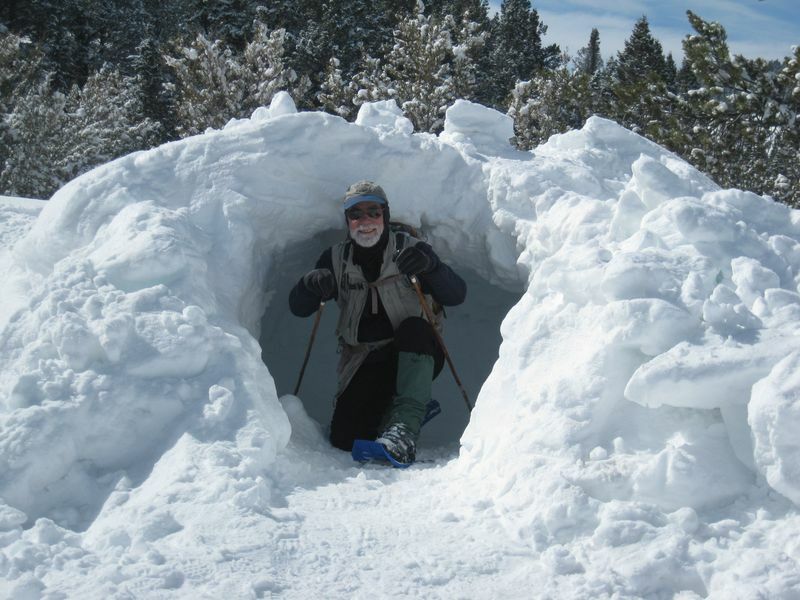 A few adventurous members of the group explored the snow caves the scouts had left behind. One snow cave in particular resembled a hobbit home with steps carved out to the entrance and a proper sleeping bench cut into the cave. 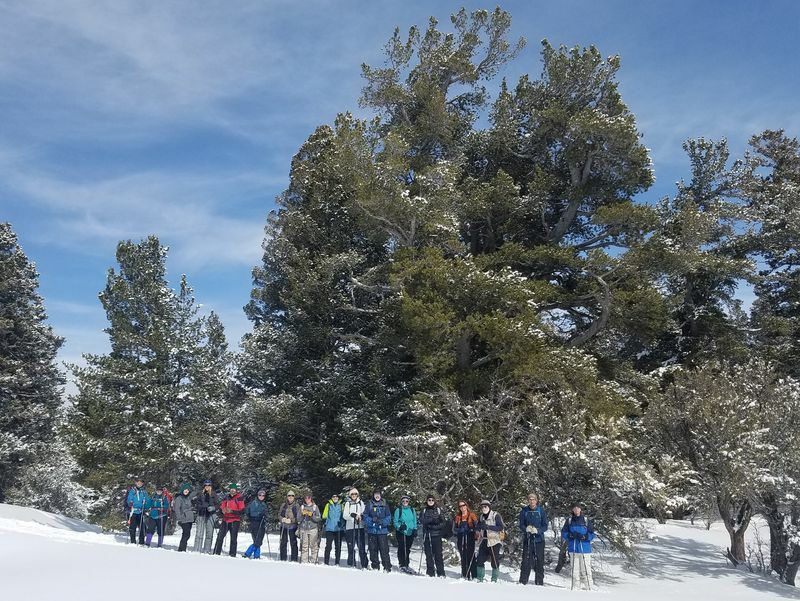 At 11:50, the group arrived at the famed limber pine. 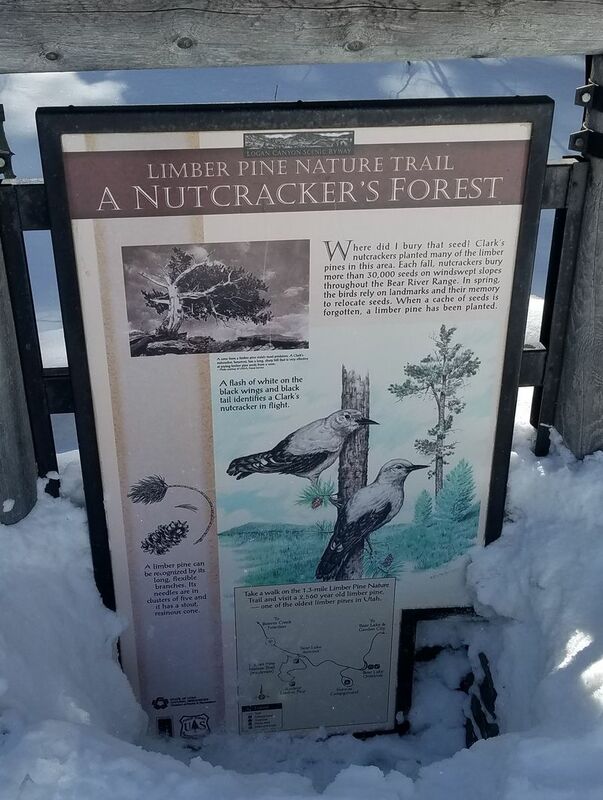 Dave P. suggested a quick, ten-minute side jaunt over to another overlook. We had lunch at the overlook and enjoyed the shelter of a gnarly, old pine. 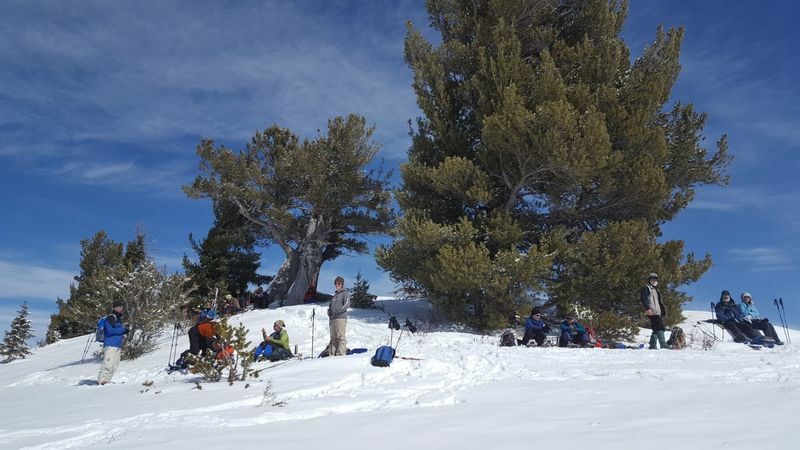 After lunch, the group resumed the loop at the limber pine. The skies were clear enough for a view of Bear Lake before the final descent. The loop trail met back up where the switchbacks started and the group decided to end the day there instead of making another trip around the loop. We returned to the cars at 1:30 and drove back down the canyon and arrived at Smith’s at 2:30. Drove 34 miles up Logan Canyon to Limber Pine trailhead. Started hiking at 11 AM; had lunch at 12 PM, resumed hiking at 12:30, finished hiking at 1:20. Skies were sunny and clear with little to no breeze and temperatures around 30 degrees. GPS tracks showed our distance hiked was 2.5 miles. Thanks to Maggie for the narrative, Maggie, Dave W. , Jane and Dave P. for photos and Dave W. for the GPS data. The group taking lunch at the overlook suggested by Dave P.